You have arrived at the Archives of all the Recipe of the Week recipes since I started in 1997. I have tried to place the recipes in easy to read categories. Just click on the recipe that you are interested in and it will bring you to the recipe directions. Hope you are a member of my Recipe of the Week Club, where you receive my new recipe via e-mail every week. You aren't? 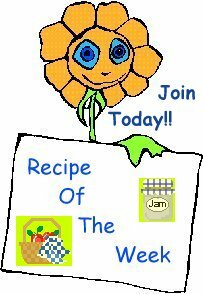 Well, look below for the Recipe of the Week flower for details on how to join. Please put "subscribe" in subject line! !